This is a huge bowl of YUM. I found this recipe on epicurious years ago and kept taking things out, adding things in and tweaking things here and there until this concoction appeared and acted like it owned the place. Soysage, walnuts and mushrooms give the dish a wonderful heartiness while the spinach gives the dish a beautiful splash of bright green throughout. Oil cured olives are a perfect salty addition to top off this dish. To de-pit them, just press the flat side of of a knife down on each of them until you feel the pit—then simply pull the olive away and you’ll have two perfect halves to throw into the dish.About the spices in this dish: use fresh rosemary if you have it—dried will work, but fresh just elevates the dish to the next level. Fennel seed and pepper: these both bring out the flavor in the soysage perfectly, so be sure to use them if you have them. In a very large skillet, heat about 2 TB olive oil over medium heat. Add the soysage and saute about 10 minutes, breaking up the soysage as it becomes more firm. Add the fennel seeds, a few dashes of black pepper and half of the fresh rosemary. Saute 5 minutes more and transfer to a large bowl. Add about 1 TB more oil to the skillet and add the mushrooms. Saute about 3 minutes. Transfer to the bowl with the soysage. Add the shallots and garlic to the skillet and saute for about 3 minutes, making sure that the garlic does not burn. 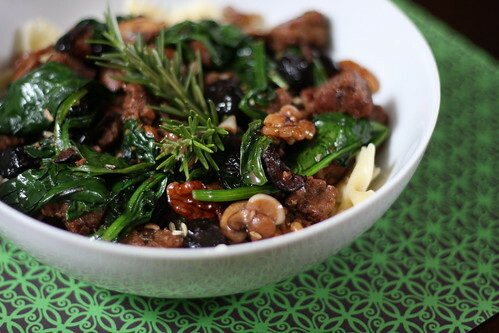 Transfer to the bowl with the soysage and mushrooms. Add the 2 TB of earth balance to the skillet and add the walnuts. Saute for 2 minutes and transfer to the bowl. Turn the heat up to medium high, wait about a minute and then deglaze the pan with the 1/2 cup of white wine. Reduce the heat back down to medium and add back into the skillet all of the contents of the bowl. In a large pot, bring water to a boil. Add some salt and olive oil and the 8 ounce of pasta. Boil, stirring occasionally for 11 minutes. While you are waiting for the pasta to cook add to the skillet, in small handfuls, the raw spinach until it is slightly wilted. Toss in the rest of the chopped fresh rosemary and oil cured olives. Drain the pasta and toss everything together until well combined. Serve with lots of fresh black pepper. I am wanting to make this tonight and hope you see this today! Do you mean a roll of Gimme Lean sausage? Thank you for getting back to me so quickly! Your blog has become one of our favorites! Your panisse, mozzarella, and jack fruit tacos are among our favorites! Thursday we're making sriracho tofu with ramen noodles and we've been debating for two days over what kind of ramen to get. Obviously vegan but do you use the flavor packets that come inside or are they packaged more like regular like pasta? Thanks, Jill. So happy you like! For the ramen, I typically buy the kind that's just noodles. If there is a seasoning packet included, I don't usually use it, because I assume there's something in there that's not vegan. Plus, adding your own seasoning (sriracha, sesame oil, fresh garlic, etc.) tastes better anyway, I think! This has become one of our favorites. We use Tofurky Italian Sausage, sliced. Thanks for such a great recipe!